Brook trout, captured in Lassen Creek, Modoc County, CA, on 8 July 2007. Brook trout fry, approximately 24 mm (1") long, in Pine Creek, CA (Eagle Lake), 30 May 2008. Photo by Gerard Carmona Catot. Brook trout fry, approximately 36 mm (1.5") long, in Pine Creek, CA (Eagle Lake), 30 May 2008. Photo by Lisa Thompson. Brook Trout are best suited to cold, clear lakes and streams and in California they have become well established in small, spring fed, headwater streams and isolated mountain lakes. They are adapted to the cold, existing comfortably at 14-19°C and feeding in waters as cold as 1°C. While they can acclimate to temperatures up to 26°C, anything over 19°C results in a reduction in growth. 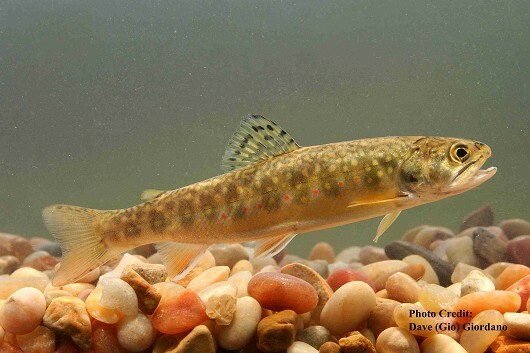 Brook Trout will primarily eat terrestrial insects, aquatic insect larvae, and zooplankton as they drift at or near the surface but are also known to feed on benthic organisms and occasionally to be piscivorous. They will eat any time they can see their prey but the most intense feeding periods are in the evening and early morning. In areas of moderate flow, where food is in abundance, brook trout will create and defend feeding territories but in slower or faster waters this aggressive behavior is greatly reduced in favor of alternate foraging techniques. Males can spawn by the end of their first summer and females their second but a year or two longer for both is common. In California the spawning season is usually between mid-September and early January when waters are between 4°C and 11°C. 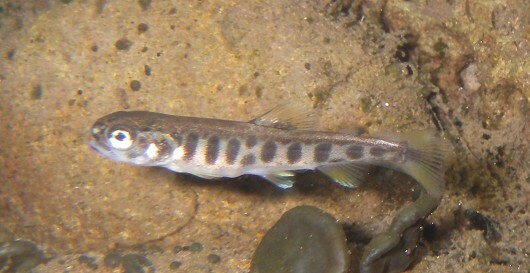 Females select the spawning site by looking for cooler areas deeper than 40 cm, with water upwelling through the substrate, pea- to walnut-sized gravel, and nearby cover. The upwelling is an important component because it controls the timing of embryo development and provides a steady flow of oxygen into the nest (redd). The female constructs the redd by shifting the gravel with her tail. This development attracts males to the site who will then compete for dominance until one establishes the authority to spawn. When the redd is prepared the pair will quiver next to each other and simultaneously release eggs and sperm into the depression. The female immediately covers the eggs in gravel, both protecting that group and creating a new redd for a new batch of eggs. About 14-60 eggs are laid per redd but 50-2,700 eggs total can be held by a single female. In California 200-600 eggs per female is the average so a female making more than 40 redds is not outside the realm of possibility. In order to survive through the winter the embryos will not hatch for 100-144 days at 2-5°C and will remain in the gravel as alevins for another 3-4 weeks. As the water warms and they absorb their yolk sac, the young trout become more active, heading to shallow stream edges with emergent plants, backwater pools, or the shallow areas of lakes where they will be sheltered from wave action. Here they will feed on small crustaceans both from the bottom and in the water column. Their growth will be based mostly on the length of growing season, temperature, population density, and availability of food, but can also be influenced by water chemistry, other trout populations, and heredity. The fastest growth occurs in moderate elevation streams and lakes with limited populations of both Brook Trout and other species. Here they can reach 15 cm in their first year and 23-25 cm in their third. The largest individual recorded was 60 cm in length and weighed 4.4 kg. Most live to be only 4-5 years old, however, many dying from lack of energy in the winter after their first spawn. An interesting exception to this is in Mono County’s Bunny Lake where stunted growth kept lengths under 28 cm but allows some individuals to live for as long as 24 years.